Picture this. It is 18th century England, and the fourth Earl of Sandwich John Montagu is hungry. He makes a request for his servants to serve some meat between two slices of bread so he could eat his meal with one hand and carry on with his other activities. It’s a request that sounds simple enough. But Montagu had no idea his simple request would start a movement around the world — a sandwich movement, that is. To honor the fourth Earl of Sandwich’s timeless creation, America celebrates National Sandwich Day on Nov. 3, Montagu’s birthday. And at Chick-fil-A, National Sandwich Day never passes without celebrating Founder Truett Cathy and his recipe for the Chick-fil-A Chicken Sandwich that he created years ago – the same recipe restaurants around the country still use today. Cathy created his recipe in the early 1960’s at his Dwarf Grill in Hapeville, GA, and it happened somewhat by chance. That’s when Jim and Hall Goode, owners of Atlanta-based Goode Brothers Poultry, offered boneless, skinless chicken breast remaining from a process they followed to provide small pieces of chicken breast to an airline. Cathy had been considering adding chicken to the menu at his Dwarf Grill restaurant, so he accepted the Goodes’ shipment and began experimenting with ways to cook the chicken. Cathy remembered how his mother cooked chicken by covering the pan with a heavy top, creating something of a pressure cooker. When he tried this on his own, he found that he could cook a moist and tender boneless chicken breast in four minutes – from start to finish. Still searching for the best way to serve the chicken breast, Cathy placed it on a buttered bun instead of on a plate all by itself. But that alone didn’t give him the result he wanted. For months, he experimented with different seasonings and breading for the chicken, eventually working his way up to more than 20 ingredients. He added a finishing touch, two dill pickle slices, before giving the sandwich to his customers for one of his many taste tests. He folded up the recipe and put it in his pocket. 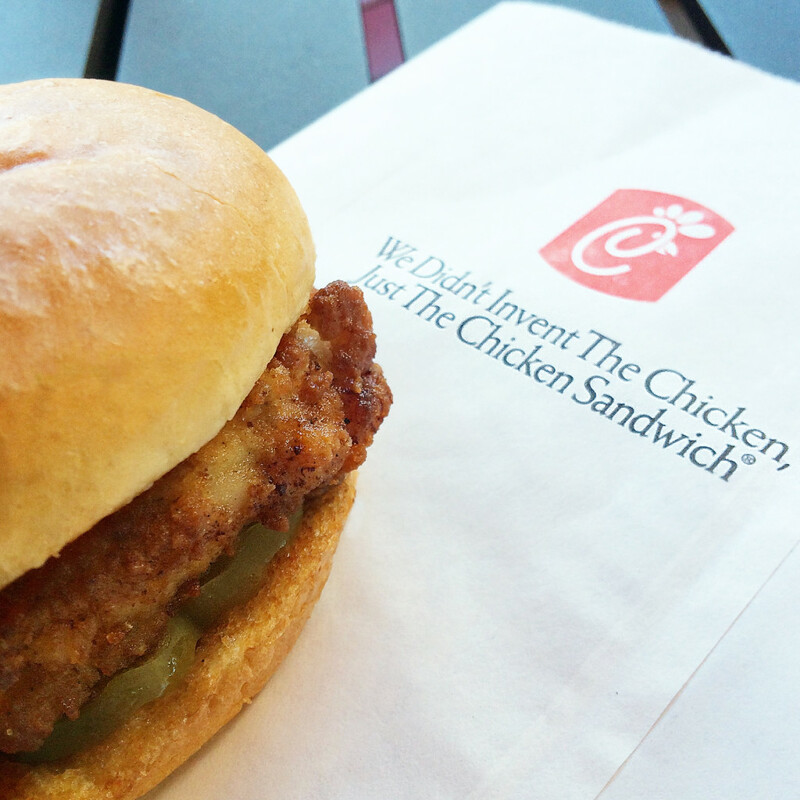 Just like that, the boneless chicken sandwich was born. So on this National Sandwich Day, we invite you to bite into your favorite sandwich, whether the Original Chicken Sandwich or the Grilled Chicken Sandwich, for lunch, dinner or a snack in-between, or your very own creation. After all, a day of such historic awesomeness deserves a tasty celebration.